Diocletian’s Palace and the waterfront at night. Croatia is a country we have really looked forward to visiting. We’ll be making a total of 4 stops in the country, all in the southern Dalmatia region. Split is the second largest city in the coastal country and features everything a traveller could want. Bustling markets and streets, 3rd century roman ruins and a vibrant food scene. 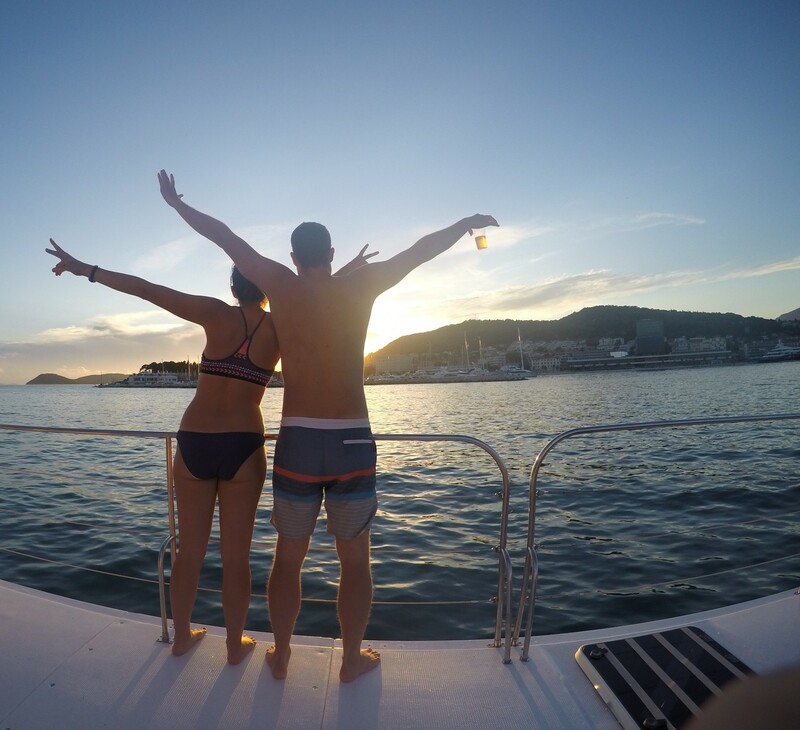 If you’ve never been to Croatia, or the Adriatic sea, its hard to describe the beauty of the crystal clear water and stunning islands, you really need to see it for yourself. View of Split old city from the park near our apartment. It is also the home of one of Dan’s favorite dishes. Black risotto. 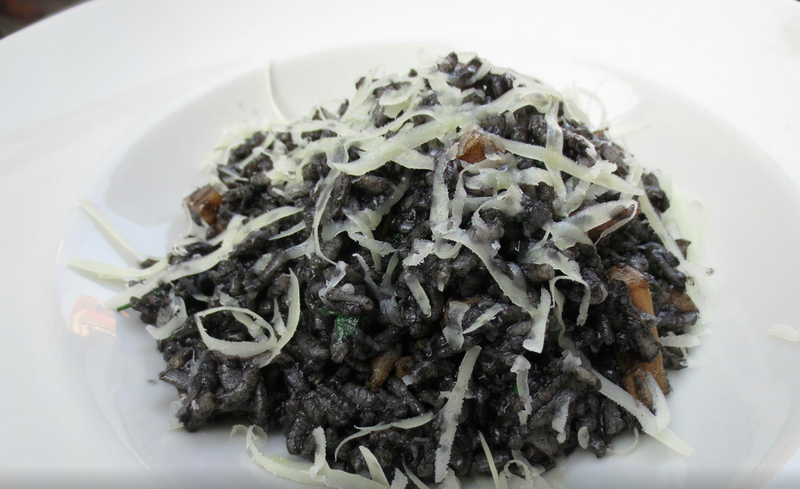 Black risotto really is black. It is a seafood dish made with rice, garlic, cuttlefish and cuttlefish ink.The ink ads no flavor, just color. It’s very strange to see on your plate, but it’s fantastic! Buttery, creamy with garlic and wine. Think shrimp scampi on steroids, mixed into soft luscious rice. 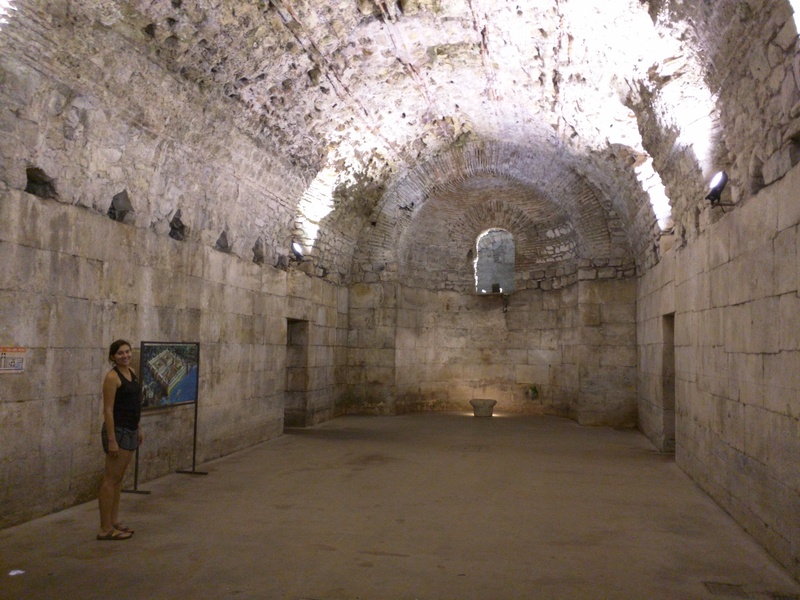 Diocletians palace is Split’s most famous monument and a UNESCO world heritage site. One of the best preserved Roman ruins in the world, Diocletian’s Palace was built as a retirement home for the emperor Diocletian in the 3rd century. For better or worse, the palace never went out of use, and it is the heart of the old city. The Croatian people have been living within the walls for 1800 years. It’s amazing to wonder the streets and see the juxtaposition of a almost 2000 year old building filled with tredy new boutiques and gorgeous modern cafes. The worse, is that over the years, the buildings inside the palace have been repurposed many times, so much of the old above ground palace (other than the walls and gates) hasn’t existed for hundreds of years. The only remaining original part of the palace is the formerly flooded basement. We spent a couple days in Split, just hanging out relaxing. There was a great running trail near our apartment, so we spent a few mornings jogging along the shore. 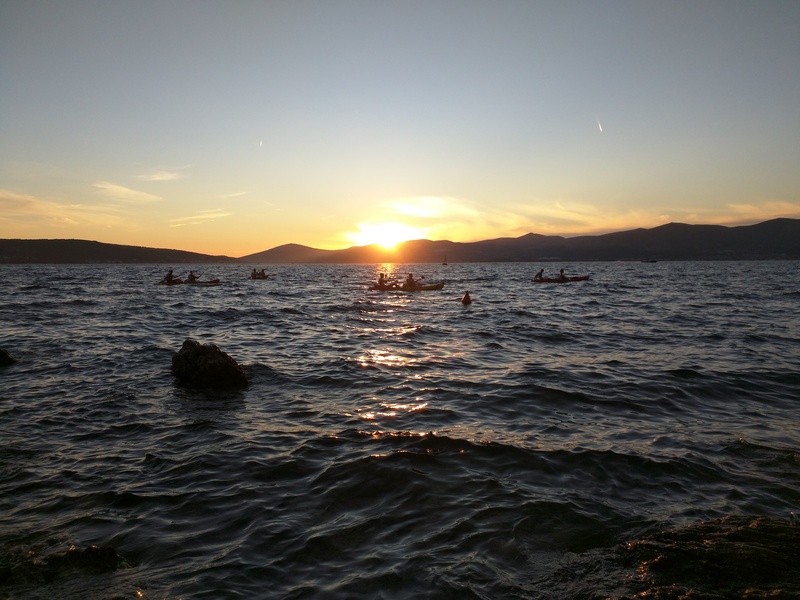 One of the highlights of our time in Split was the evening that we packed a picnic and headed out to the end of the peninsula to watch the sunset. Gorgeous to watch the sun set over the islands off the coast, while blue and orange shimmers off the sea. Right at sunset this kayaking crew cruised through our view. 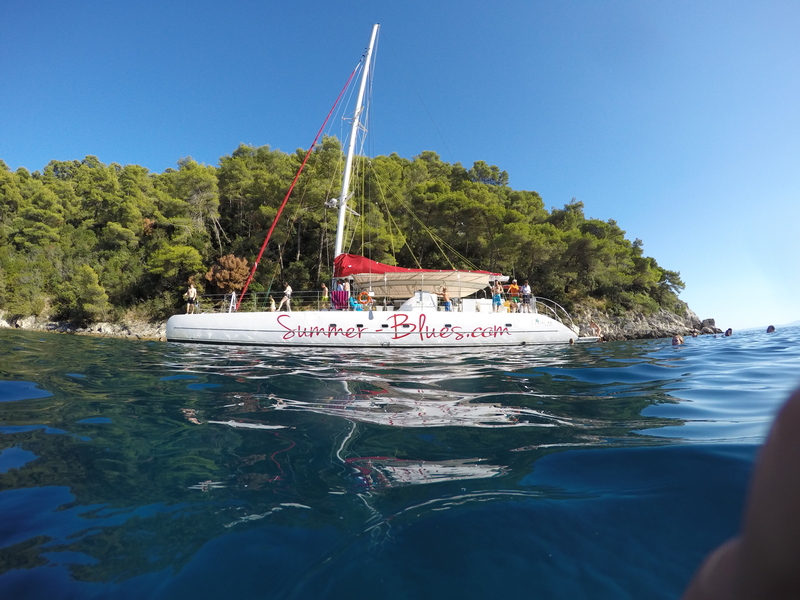 Our last day in Split, we took an all-day boat cruise to the island across the bay, Brac. The boat cruise, was a little hit or miss. 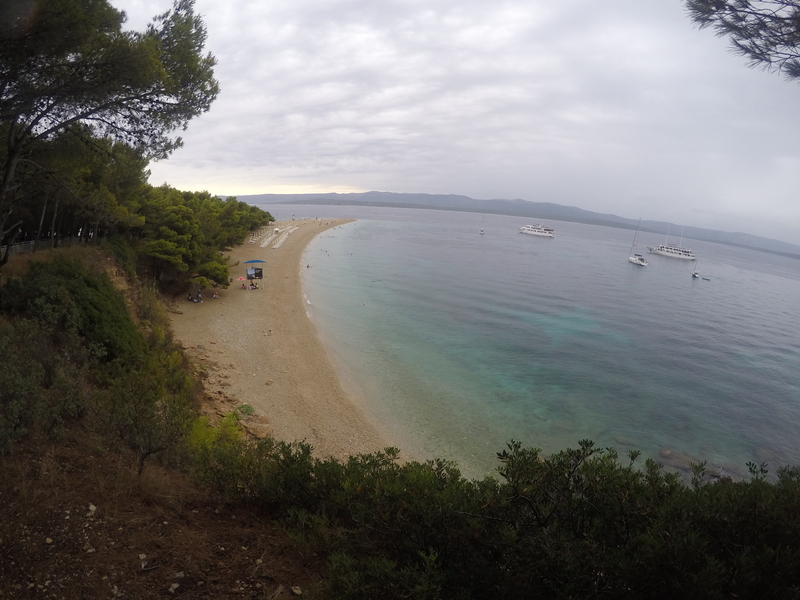 It started raining right before we reached the feature attraction, Brac’s Golden Horn Beach. The entire time we were at this beach it was pouring rain. One of the most famous beaches in Croatia. It’s not sand, but marbles sized pebbles.. Although Kristin and I are getting to do all this fun stuff, we are on a very tight budget, and haven’t payed for many tours. We we’re very excited for this trip and thought the entire tour was going to be spoiled by rain! 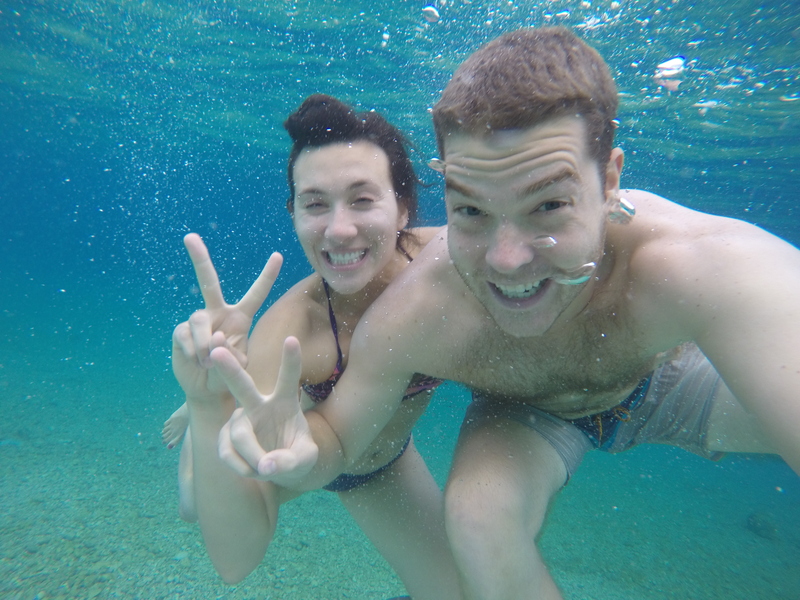 The wind and rain were freezing, and we had no choice but to swim, as the water was warmer than sitting on the beach. Croatia’s water is crazy clear. You can see forever bringing out tons of colors in photos. Soon after leaving the city of Bol, the sun broke and we sailed into blue skies. As we pulled into a little cove for our afternoon swim, the weather was perfect. Once the rain finally cleared, we had a great afternoon swim. A long awaited swim was great for our spirits and our day. We really enjoyed it and finally got a chance to meet some of the other guests on the boat. It was like the united nations, with every group from seemingly a different country. Sweden, South Africa, Canada (French), Netherlands, France, Belgium, Australia, Italy. We represented hard as the only group from the ‘merica! As we cruised, home we relished a beautiful sunset. As it was during the wedding. The rain ended up throwing a wrench into the plans, but made for a more memorable experience in the end!